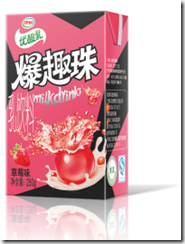 Inner Mongolia Yili Industrial Group Launches two new UHT yoghurt drinks. The two “Baoquzhu”-branded beverages, packed in combiblocSmall 250 ml from SIG Combibloc, contain alginate balls filled with juice, which burst in the mouth when gently chewed. The result: an extra portion of fruity drinking pleasure. 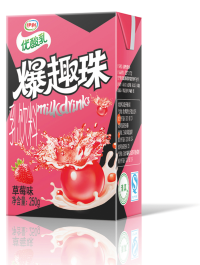 These yoghurt drinks are available in apple and strawberry flavours. Produced using the drinksplus solution from SIG Combibloc, they have taken Yili to a new level in the field of beverages with perceptible added value. The drinksplus solution makes it possible to fill products containing up to 10% solid pieces using standard beverage filling machines from SIG Combibloc, e.g. drinks with nata de coco and now also with alginate balls with juice in liquid form inside them.